The Chevrolet Bolt is the first electric car with over 200 miles of range. This is a huge accomplishment for GM and it establishes its commitment to the EV market. The fact that they brought it to market before the Tesla Model 3 is a big coup in of itself! For anyone who is interested in an EV, it should definitely be the first or second car you drive. I have driven it and thought it to be a very competent and very marketable vehicle, note I said vehicle, not "EV." However, this story is about the predecessor to the Bolt that many people did not even know existed. I am talking about the Chevy Spark EV. The Spark is known as a "compliance car." For anyone who is unfamiliar with that term, it means a car that the company for forced to build to comply with the zero emissions requirement that came out of the Obama administration. Now, by definition, compliance cars are thought of as cars what no one wants to buy. Essentially, automakers are forced to make them and because of that, they put little effort into trying to sell them. That is until they have been sitting on their dealer lots for months and months. That is when the steep discounts and lease deals come in as incentives to get people to come in and buy these cars. This is how I came to lease my Chevy Spark EV. A local dealer was offering what amounted to $10,000 off the MSRP on top of the $7500 federal & $3000 state rebate for buying a zero emission car. I decided I could not pass up the deal and would use it as my commuter car and save the miles on my Mazda 5. This all happened in July 2016 and the rest of my story is about my experience with my Chevy Spark EV. The Spark EV is what they call a mini car. In other words a smaller car than a subcompact. What it is: The Spark is a fun little car to drive. The instant torque (400lb-ft) propels the car in 7.9 seconds and generates 140hp! Not bad for a little mini car right! By comparison, the gas version of the Spark takes 10.8 seconds to get to 0-60. It is not a road trip car. The range is limited to 82 miles. However, with the quick charge option, you can charge the battery back up to 80% in about 30 minutes. In my experience, the biggest limitation of this car besides the obvious lack of cargo space is its limited range. Speaking from experience, if you have a 32-mile commute each way and cannot charge at work, this would most likely be a deal breaker for this car. I know this because I ran out of charge within a mile of my house one day. Lesson learned: Do not rely on having 15-20 miles of charge as a buffer. Using the AC or heat will eat those miles is a hurry. I have since learned that the way most people work around the HVAC system from draining too much range is opening windows in the summer and using the heated seats only in the winter. Spark is a fun little runabout car that I affectionately call my little electric go-kart! As long as you view it as that, you will not be disappointed. However, if you expect it to be more than that, you will be wishing for more. 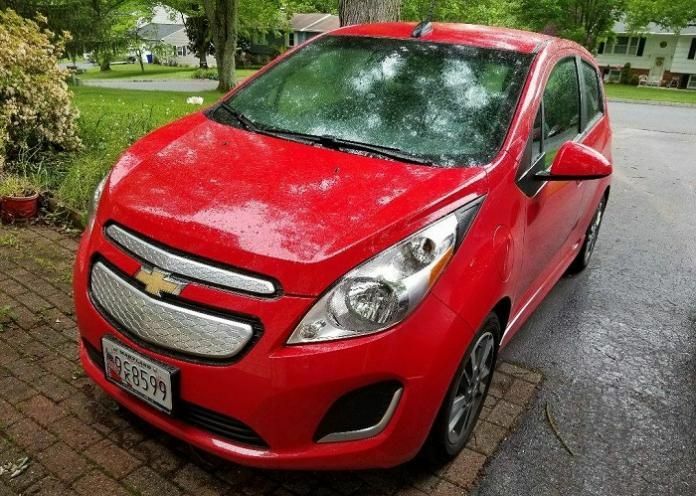 In my opinion, it is a shame that GM decided to kill off the Spark EV once the Bolt came out. The Bolt is no doubt the EV for people who need some cargo space and need more than 200 miles of range. However, I cannot help but think that the Spark could carve out a market of its own for the people who just want a fun city car and don’t need more than 82 miles of range.